Yes, it's finally here. You can now import studies from PACS nodes to the local archive. 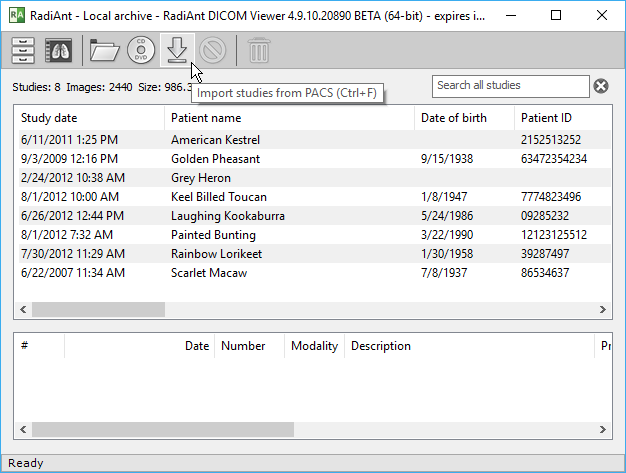 You can also push studies from other PACS locations to RadiAnt's DB. We'll appreciate your comments & suggestions. I would like to give one suggestion. On the database local database window it would be nice if the column "titles" like name, keywords, patient ID, study date could be changed in position. For teaching purposes having the keywords as the first column would be very nice. Therefore all individual preferences would be met if we could rearrange the columns. I like the new Load cases icon in the DB viewer too. That button DB (enable/disable import to local archive). May be it will be better, if by default that button will be Enabled, not disabled. Thank you guys for a warm reception of this new feature! Columns will become customizable (presence, order, width). If you click the PACS button in the DB window, the DB icon will be green. When you click this button in the viewer window, RadiAnt assumes that you want it only in the temporary storage and disables DB import, making the DB icon red. We will probably add an option to enable DB import by default, regardless of which PACS button was pressed. With great achievement comes finer adjustments. # Option to select existing / new database location DURING INSTALL. # Prevent change of database location during update. The location of the default database is not changed during update. We might add an option to select the DB during installation.